Last week I spent a few days in Las Vegas with my fun hubby. We went to see the musical "The Lion King" at the Mandalay Bay Resort and it was fabulous. While we were waiting for the show to start, we wandered around the resort shopping center. We ran into a little crepe place and it gave me the idea to create a Vegan Crepe when I got home. 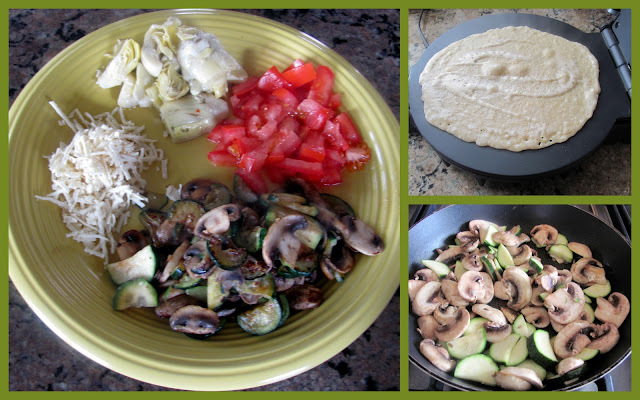 One of their crepes had artichoke hearts, tomatoes, grilled mushrooms and zucchini-topped with marinara sauce-yummy! I began my creation on Saturday and my first attempt turned out perfect! I used freshly ground white whole wheat flour, almond milk, water, Earth Balance and salt. I used my Villaware Tortilla Maker to cook them, but you can use any skillet. I left my tortilla maker open and only cooked one side of the crepe. While cooking you add the filling and flip both sides of the crepe over to cover the ingredients. You need to chill the crepe batter for at least 2 hours, so plan ahead on your meal. Do not leave this step out or your beautiful, delicate crepes won't turn out. I hope you will give these crepes a try. They are sooo....tasty and extremely easy! 1. In large bowl mix all ingredients together. Cover and chill for at least 2 hours. Do not leave this step out or the crepes will not turn out. 2. Depending on the pan you use to cook the crepes, you can add a little coating of oil if needed. My tortilla maker did not require any oil. Pour about 1/4-1/3 cup batter on the pan and use a knife to smooth the batter out in a circle and create a thin surface. When the top of the batter looks dry, add all your fillings in the center. Flip edges over the filling and remove from skillet. Place crepe so the folds are facing down on the serving platter. Cover with your favorite marinara sauce and garnish with non-dairy cheese & fresh parsley. In small skillet add 1 tsp. Earth Balance. Grill mushrooms and zucchini until tender. Add salt & pepper to taste. Arrange artichoke hearts, diced tomato and the grilled mushroom/zucchini mixture on a plate in preparation for filling crepes. Arrange crepes on plate. Cover with warmed marinara sauce, a sprinkle of Daiya cheese and fresh parsley. WOW! What an awesome recipe! Cant wait to try it out!!! Yum, what an interesting combination. I love crepes and Vegas! Thanks for sharing. Thanks Lay, Morgan and Alex for your comments. I know this combination of filling is really different, but it was sooo....good together. You will have to give them a try:) I may not have put this filling together if I had not seen it at the crepe store. You ladies are awesome! I've been wanting to make crepes for years. Sure hope I do it soon. That Marinara Sauce looks especially tasty. Oh yum....this sounds amazing! I've never made crepes, but when I decide to give it a go, I'm going to have to try your recipe out for sure! It looks delicious!